Irish amateur legend Paddy Barnes will make his second professional appearance against an opponent to be confirmed at the Belfast Waterfront Hall on Saturday February 18th, live and exclusive on BoxNation. Belfast’s two-time Olympic medallist received an incredible reception on his pro debut last time out at the Titanic Exhibition Centre and is delighted to be returning to the ring next month for what promises to be another top evening of boxing for the city. His victory on November 5th came via an unusual ending after the outclassed Stefan Slavchev inexplicably lifted Barnes during the fourth round and was consequently disqualified. After a short Christmas break, Paddy is back in the gym and preparing for a huge 2017. The ferocious Flyweight is promising another unforgettable night for his army of fans and is aiming to kick the New Year off in style. Tickets, booking information and further undercard additions will be announced shortly. Dublin’s Declan Geraghty (14-1-0, 4 KO’s) will face Belfast’s James Tennyson (17-2-0, 13 KO’s) for the Vacant Irish Super-Featherweight title. Having recently picked up another vicious knockout win on Frank Warren’s November 5 ‘Homecoming’ bill, ‘Pretty Boy’ is in a rich vein of form. 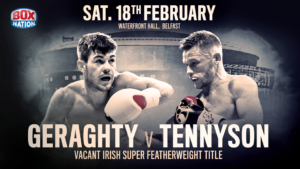 Eight victories in succession since his controversial loss to Jono Carroll back in 2014 has placed Geraghty firmly into title contention. The big-punching Tennyson boasts a high knockout ratio and will be looking to send his fans home happy with a memorable win on home soil. 23 year-old Tennyson captured the Irish Super-Featherweight title in only his sixth fight and is determined to get his hands on it again. Both men are targeting titles and further big fights in 2017, making for what promises to be an explosive clash. This one is set to be a classic domestic encounter with plenty of Irish pride at stake. Belfast Light-Heavyweight talent Steven Ward will aim to improve his unbeaten record to 3-0. 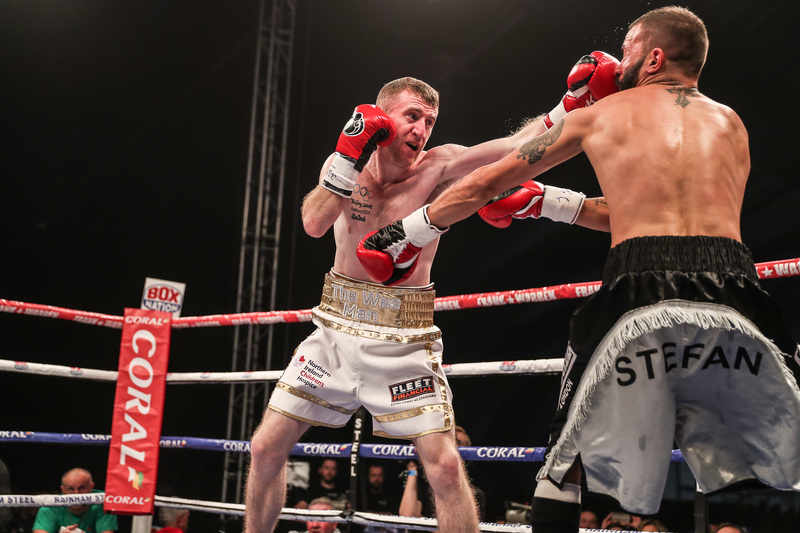 Ward made a perfect start to life in the paid code, outpointing the tricky Merdjidin Yuseinov on his pro debut at the Titanic Exhibition Centre in November before overcoming experienced journeyman Remigijus Ziausys four weeks later in Coventry. Now the former Irish amateur standout is preparing himself for a busy 2017, starting off with a four round contest in his home city next month. The 26 year-old 2010 Commonwealth Games silver medallist is promising another strong performance for Belfast fight fans.